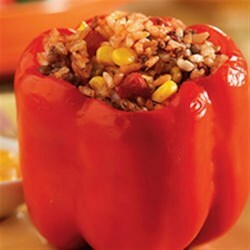 "Bell peppers are filled with brown rice, browned ground beef, corn and salsa for an easy weeknight dinner with a southwest twist." Spray large nonstick skillet with nonstick cooking spray. Add meat and brown over medium heat; drain off excess fat. Stir in corn, salsa and rice. Pierce peppers with a fork or sharp knife; place in baking dish. Fill peppers with meat mixture. Cover with foil. Bake 20 minutes. Uncover; sprinkle with cheese before serving. * Or, substitute ground turkey. If softer bell peppers are desired, reduce oven temperature to 375 degrees F and cook filled peppers (covered) for one hour. I boiled the peppers for 5 minutes before stuffing, and baking. Recipe works like a charm feel free to boldly add whatever chopped veggies you wish from your leftovers and for fun I used red beans and rice. YUM! Very easy and tasted great! Pretty good- definitely needs to cook longer than 20 minutes though. Next time I will also melt the cheese before serving. I love this meal!!! It was great tasting, a quick meal and easy to make.